Snausages Snaw Somes! make treat time even more enjoyable with flavor-packed Beef & Cheese Flavor Dog Treats. The savory flavors of smoky beef and cheese are twisted together into a chewy rope shape for a treat that’s too much fun for just one flavor. It’s soft enough for any dog to eat, from puppies to seniors that might have tender gums. The twists and turns give it a texture that’s exciting, and the combination of snack-worthy flavors make it way better than just chewing on a rope treat. 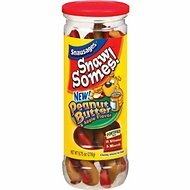 Snausages Snaw Somes! can be broken into pieces for smaller pups, and you can always save the rest for later in the resealable container. 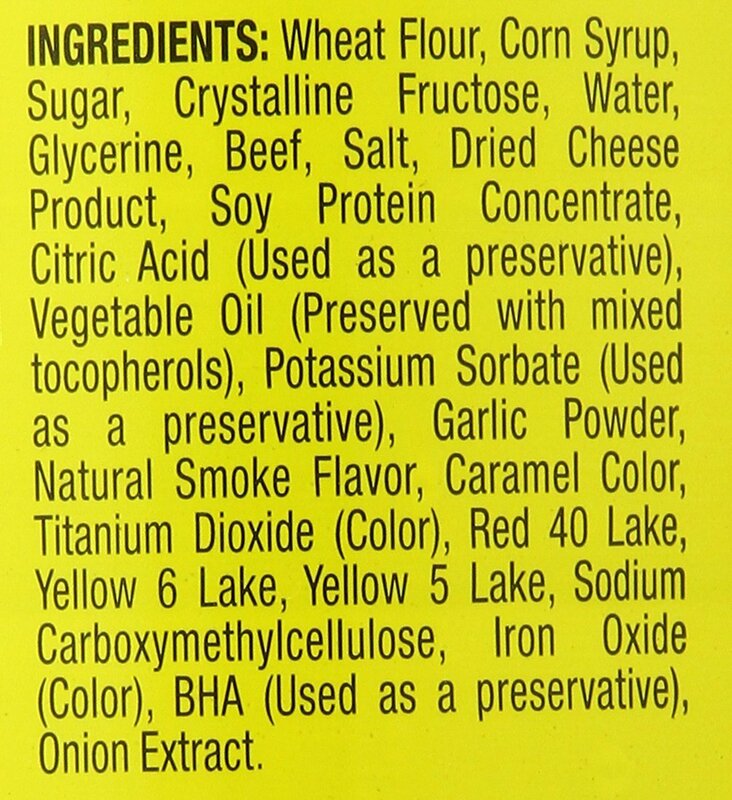 Wheat Flour, Corn Syrup, Sugar, Crystalline Fructose, Water, Glycerin, Beef, Salt, Dried Cheese Product, Soy Protein Concentrate, Citric Acid (Used As A Preservative), Vegetable Oil (Preserved with Mixed Tocopherols), Potassium Sorbate (Used As A Preservative), Garlic Powder, Natural Smoke Flavor, Caramel Color, Titanium Dioxide (Color), Red 40 Lake, Yellow 6 Lake, Yellow 5 Lake, Sodium Carboxymethylcellulose, Iron Oxide (Color), BHA (Used As A Preservative), Onion Extract. Feed as a snack or treat, as a part of a healthy diet. We recommend no more than 1/2 Snaw Somes treat per every 20 lb of body weight per day. Not one I can give Kallie often, and not one for larger dogs/hard chewers. But for smaller dogs & dogs missing teeth, tough enough to satisfy chewing urges & soft enough for those without teeth to enjoy. Annabelle just loves the Beef & Cheese Snausages. I give her one as a special treat. She takes it and runs to gobble it up. What happen to the price!!! My 13 year old golden retriever loves these treats. I have been paying $2.98 for them. This month they are $4.62. WOW. I will no longer order these from chewy which is a shame because Chewy really does make shopping for your pets easy. I'M glad I ordered them for my pet,I thought there would be more in container, but he does like them, and I break them up and put in the other ball I ordered for him that dispenses treat's ashe rolls it around floor and gets a treat. Lola's not thrilled with these snacks. I thought she'd like them because she loves cheese. My dogs loved them.They kept wanting more.So I had to order more!! My older dog loves this because it is easy for him to chew. This item is one my dog loves to eat. Chewy is the only place I can find them. Nice Looking Treat For Seniors !!! But I have 2 senior doxies. This is to hard for them. I like the design of these they smell like they would like them. I gave them each a piece . And they had a hard time eating them ! !